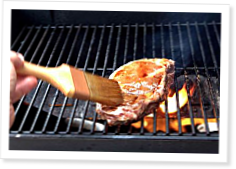 Nick Massie tells you how to prepare the perfect steak over an open flame. It’s possible that nothing more closely ties us to our Paleolithic ancestors than cooking over an open flame. Ever since tongues of fire licked the first piece of meat, we have craved to indulge again and again. Through the years, we have improved on the practices of our primal forefathers in many ways, but meat cooked over an open flame has remained virtually unchanged. As summer rolls around and we fire up the grill, it’s time to take a look at one of the simplest and tastiest of culinary delights: the grilled steak. In this article, I’ll teach you how to grill a restaurant-quality steak that will impress your friends and make you the envy of the neighborhood. Simplicity, I believe, is the key ingredient in food preparation, and this certainly holds true for grilling a steak. I’ve provided simple guidelines and one basic recipe that will turn you from a grilling greenhorn to a guru in no time flat. Mise en Place: CrossFitting chef Nick Massie on how to make cooking fast and enjoyable. Great article, and I'm planning to have steak tonight anyway, so I'll try this method. There's a reference to an infrared thermometer and mention of temps between 500°-800°, but I noticed that there is no mention of the target grill temperature. What is recommended for this technique? This is the high heat technique, which will yield a crisp, caramelized outer with a warm, reddish-pink inner. To achieve this, I do not close the lid on the grill, so if that is what you are referring to, then I wouldn't have a temperature recommendation because the lid is always open, which will not allow for a temperature reading. If you are looking for a temperature to turn the knobs to, that would be high. The goal is to keep the grates as hot as possible, but you need to monitor the flame as well. The olive oil will cause flare ups, which is fine, just make sure that there is not a constant flame on the surface of your steak or it will burn and become bitter. For those of us who still believe in God, maybe the title could read, "Grill god"...or something like that. While the beginning of a sentence should always be capitolized we should not use the term/word "God" carelessly. Just a thought. Soy-sauce and salt. Jeeze salty as hell. My suggestion is stay away from soy-sauce. First, it's soy. Second, it's more salt. Other than that I use fresh minced garlic with extra virgin olive-oil. And last night i tried that with some chili powder. Absolutely delicious! Is there a lower sodium solution to this SOW mix. I got a new grill for fathers day and I am planning to break it inon some steak this week. In the past I would use a mix like that but now that im going mostly paleo and cutting things like that out its a bit harder to find good things to put on a steak. There are some lower sodium options. I use Tamari because I like it. If you are worried strictly about sodium and not soy, then you can go with a low sodium soy sauce and less salt. If both sodium and soy bother you, then coconut aminos are best. They impart a similar flavor, but have 65% less sodium and no soy. You can also use the recipe in the article and play around with the amount of salt that you put on your steak initially. "Grill Juice" is designed to work with thick-cut steaks, so that all of the flavor is sealed into the caramelized crust, which is balanced by the inner, warm, meaty goodness. Most of the grill juice actually capillaries around and falls into the flame, it is only a small portion that is actually sealed into the crust. Through experience, you'll figure this out.